It was a perfect fall day in mid-November with a sunny sky and unusually high temperatures approaching 60 degrees. I walked along a road with majestic oaks bordering one side and a glassy lake on the other. It felt like I had the serene world to myself with only an occasional car passing by. As I continued on I came upon an older gentleman with pitch fork in hand standing near a pile of leaves that stretched to the edge of the woods. As I approached more closely I saw smoke rising from the dry leaves. He had set them on fire. Somewhat concerned, I stopped and exchanged pleasantries, then casually asked, “How will you keep it from spreading into the woods?” “I want it to go into the woods,” he said. Surprised, I asked why. His response: “Buckthorn. ” I had noticed the abundance of this invasive non-native plant and how it covered the entire forest understory. I had walked several miles on the trails of this particular property and it had clearly taken over. It was everywhere. The gentleman began explaining how he had begun burning the forest edges and portions within the woods last year and had seen a marked improvement already. “It kills the young saplings and destroys some of the seeds and fruit,” he said. “Each year we’ll do a little more and hopefully one day we’ll get it under control. I suppose we’ll never get rid of it all, but that won’t stop me from trying. ” It seemed pretty overwhelming to me. The day I was there it looked like he had only burned a little less than an acre, and it bordered more than 500 acres beyond that. It didn’t stop there; I had noticed on my drive to this little retreat that the unwanted undergrowth lined the forest edges for miles around. Appearing to be in his late 50’s, I imagined the day of no more buckthorn might not even happen in his lifetime at the rate he was going. Even if he could one day get a handle on his little corner of the world, the bordering landscape would continually press in and encroach on this beautiful place. Yet, as he plaintively leaned against his pitch fork watching the smoldering flames like a mesmerizing campfire, he spoke with a sense of hope and ambition. I admired him. He faced an impossible mission, yet he wasn’t discouraged or defeated. He wasn’t going to give up. He was determined to do what he could to impact his little part of the world. I think of the times when I’ve faced what seemed like an impossibility in my own life and have been tempted to give up. Sometimes, without invitation, the outside world invades mine and I feel overwhelmed to do anything about it. There have been seasons when I’ve let things get too far out of control to the point of choking out all that’s good. And at other times when I’m faced with the needs and injustice in the world, I feel too insignificant to make an impact. This man’s determination reminded me that no matter how overwhelming a circumstance may seem, there’s always hope. I suppose I’ll never get rid of all the injustice in the world, but that won’t stop me from trying. I may not be able to change the whole world, but I can change the small part I call home. And maybe, just maybe … someone may stroll along someday and see me fanning the flames, only to realize they can change theirs too. What triggers bloom in houseplants? Plants bloom if they get good care — the right light, temperature, water, food, and growing medium — but the details depend on the particular species. If you can get one African violet to bloom, you’ll be successful with any of them. But if you treat your kalanchoe the same way, it will probably never flower. The goal is to provide an environment that’s as close as possible to conditions in the plant’s native home. Some plants, for instance, have learned to face adversity — periods of cold or dry — by going dormant for a while. For many, going through this dormant period is required to trigger blooming. In the wild, plants recognize when to go dormant by being sensitive to shorter days, lower temperatures, or reduced rainfall. In a house, dormancy is induced naturally by shorter days, or by your withholding water or putting the plant in a cooler spot. Growth slows, and the plant needs less fertilizer and water. When days lengthen and become warmer, or you resume more generous watering, you complete the cycle and flowering begins. Other plants come from environments where light, temperature, and rainfall are about the same all year. Those plants can grow and flower anytime, so they rarely need a dormant period to induce flowering. Since they are always growing, the amount of light, fertilizer, and water you give them throughout the year remain constant. The amounts depend on the species. Most geraniums are easy keepers, but the zonal ones are the best survivors. They have round leaves, usually with concentric stripes of colors around the edges. And if they are given a combination of cool temperatures and strong sunlight, they will repeatedly produce large flower clusters. The most important tool for nurturing them is a pair of shears; geraniums tend to become gangly even when conditions are perfect, and they can get extremely gangly if light is scarce. Frequent cutting back will keep them bushy and healthy. My Mom’s favorite, today’s African violets are the most popular of all flowering houseplants. They trace their heritage to several species collected in East Africa in the late 19th century, but their appearance today derives from years of intensive hybridization among only a few of the species. The original blue and purple African violets are still happily blooming, but most have yielded the spotlight to new color tones. Modern violets also appear in white (the touchiest sort to grow), all shades of pink, burgundy, and even crimson. Generally, African violets need abundant filtered light. In summer, however, move plants away from any direct sun to where they will receive less intense, indirect light only. Violets like the same comfort level you do: average room temperatures or a little warmer in the day and a few degrees cooler at night. Keep the humidity high around your plants by placing them on a humidity tray, but never allow them to sit in water or the plant will die from fungal rot. Whenever the top half-inch of soil feels dry to the touch, add enough water to make it evenly moist. There are many, many websites dedicated to the care and nurturing of African violets. Hasn’t everyone tried to grow a big, beautiful, flowering Peace Lily received as a gift? The Peace Lily tops the list of plants that provides beautiful foliage and flowers AND is easy to grow. The plant thrives indoors and blooms reliably with minimal attention. White flowers with a stiff yellow center (similar to those of a calla lily) appear nearly continuously amid the large, dark green, oval leaves. The plant needs low to medium light (never direct sun) and average indoor conditions. Its tropical foliage looks best, however, if you raise the humidity around it by setting it on a humidity tray. Moisten the soil evenly when the top inch feels dry to the touch; reduce watering when room temperatures fall below 70ºF, and never expose a plant to conditions below 55ºF. Why should you let Mother Nature dictate when you can enjoy gardening? There are hundreds of lovely houseplants that need care and love, and are currently sitting at your local nursery or garden center waiting for you! From the Outagamie County Master Gardener Association, may you have a happy and blessed Thanksgiving! We worked together in a traditional garden plot approximately 8×10 ft and wanted to focus on growing veggies we had not grown before. We decided on several heirloom varieties. Our trail of Gold Marie pole beans did well as did the Cour Di Bue ox heart cabbage which was very tender. The Sweet Dumpling winter squash was very tasty. We also liked the round (pool ball) zucchini. But the squash would have fit our space better if we had grown them on trellises. Our choice of two heirloom tomatoes produced well, but grew too large and took over a large amount of our space. Our patio tomato did well (but produced less) and was a better size choice for the space we had. One of the best things we tried was the Lincoln leeks. They needed to be started indoors, but were relatively easy to grow and were delicious! Our over-all perspective was don’t be afraid to try new things, as most did very well, were great tasting and we were able to save seeds from some of the heirloom varieties. One important lesson we learned was to be more conscious of the space you have. Pick varieties that fit your space and or utilize more trellising. In all it was a very positive learning experience! Surely no one has missed seeing the ubiquitous Stella D’Oro daylilies that adorn every bank, shopping mall, and school in suburbia. As a result, there is a tendency to scorn daylilies when pulling together your garden — but that would be a huge mistake! [Note: even Stellas deserve your respect for their continuing bloom throughout summer.] There are thousands of varieties of daylilies and they rank among the easiest perennials to grow. With the myriad of colors, your garden can be a rainbow of color from early spring into the fall. For my own purposes, I classify daylilies as ‘spiders’, ‘ruffles’, or ‘bells’. Stellas fall into the ‘bell’ category with their classically shaped flowers. I have a whole bed of lilies that would fall into the ‘spider’ category in shades of mauve, peach, lemon yellow, and orange. The ‘Peach Pie’ shown in the photo above would fall into the ‘ruffles’ category and I can’t wait for it to flower every year. The petals are so delicate and the flowers so beautiful! ‘Star Bright’ is definitely a ‘spider’ daylily, and how lovely are those curling, curved back petals?! This one has 8-inch blooms: apricot flowers with violet and red eye zone and pale green throat. I was pretty excited to learn that it’s cold-hardy in USDA Zones 4 to 9 (I’m at 5). This one blooms early to mid-season, is 32 to 40 inches tall, and 24 to 36 inches wide. I would definitely find a spot for this beauty in my garden! I’m a sucker for the pale pastels: peach, cream, and pale yellow. With that in mind, then, is it any wonder that I have my eye on a ‘ruffles’ cultivar that would look beautiful tucked next to some fuchsia bee balm. ‘Marque Moon’ has creamy white flowers with yellow throat and edges in the summer. On a sunny day, the petals glisten. Some daylilies have a glitter quality on their petals. When the sparkles are white, it’s referred to as ‘diamond dusted’. With yellow-flowered cultivars, it’s more gold-colored so those are said to be ‘gold dusted’. The glitter and the sweet fragrance beg for a spot near the front of your garden. This one blooms mid- to late season, and is 20 to 24 inches tall, 18 to 24 inches wide. Cold hardy in USDA zones 3 to 9.
usual leaves are long and arching, and the variegation is stable, so it won’t revert back to all-green leaves. They start the season green with creamy white margins that turn yellow later on. This one is compact (15 to 24 inches tall and wide), which makes it perfect for the front of a border, where it will bloom midseason. This winter, as you gaze at the catalogs that start arriving around Christmas, and you can’t wait to get your planning started, I hope you’ll consider a spot in your garden for one of the many daylily cultivars that will add beauty (and almost no work) to your landscape. Sweet bags & sachets are a lovely way to perpetuate aromatic treasures from the garden. Place the scented sacks throughout the house — selecting fabrics, trims, and fragrances to complement each room. In the dining room, velvet and organza sweet bags exude the scents of lavender, rose, and rosemary — an antique bouquet reminiscent of an English high tea. In the bedroom, an ivory linen pouch filled with calendula and lemon verbena enhances the romantic ambiance. Or, perhaps, eucalyptus, lobelia, or peppermint to help promote free breathing. A sachet of lavender, tucked into a lingerie drawer, has long been a personal favorite. Place sweet bags and sachets anywhere you would like to savor the preserved perfume of a garden. Choose a predominating fragrance or create distinctive mixtures for each room. Sew tiny bags using a combination of lovely fabrics and fun trims. (Note: if you don’t sew, as the fabric store to recommend a local seamstress). Or, alternatively, fill beautiful cut glass bowls to sit in the various rooms to hold the mixture. 4-6 cups dries mixed botanicals, such as fruit, flowers, herbs, or spices, and fillers such as evergreen twigs and needles, small pine cones, and wood shavings. Combine the ingredients in a covered glass jar. Shake well to blend and place in a cool, dark place to mellow for about 10 days before filling the sachets. Finding an extraordinary holiday centerpiece is so easy if you take the time to “force bulbs” such as the classic Amaryllis or Paperwhite. It takes approximately 4 to 6 weeks for them to go from bulb to bloom so a trip to a local nursery or garden center NOW is all it takes to locate the bulbs. A starter kit usually comes with a filler (special potting soil containing a medium with ample drainage, or glass beads.) and a container to plant them in. Or, you can save your bulbs from year to year as I do. 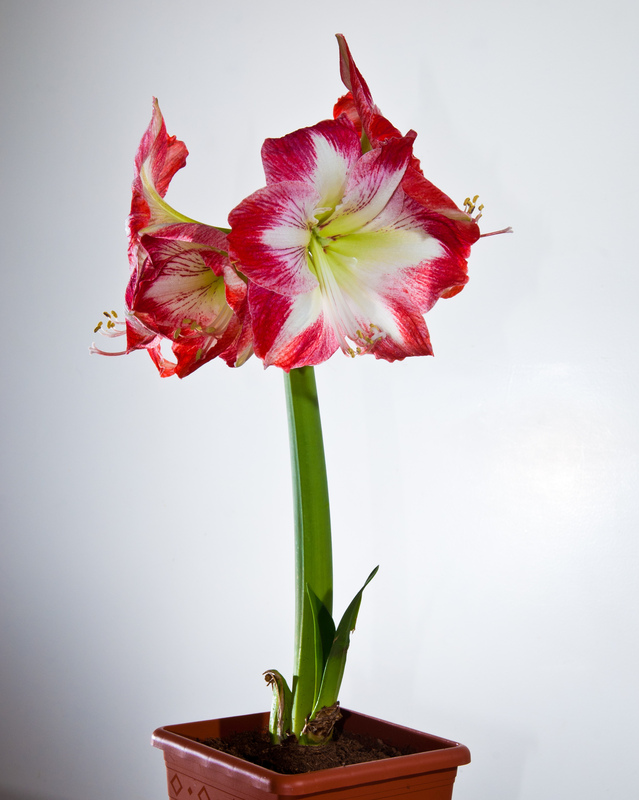 Amaryllis – Show stopper trumpet-looking flowers on tall sturdy stems with bright green shiny leaves. Blooms come in colors of red, white, pink, or a combination such as pink and white. Paperwhites – According to Greek mythology, Narcissus was smitten with the reflection of himself in a pool of water. He stared at his image until the gods turned him into a flower. Blooms of Paperwhites come in white or cream colors and they have a heavenly fragrance that permeates the room they adorn. Amaryllis – The filler will be very dry so take a few minutes to soak it before planting the bulb. Place the bulbs with the root side down into the filler and be sure to gently press the filler around the bulb to anchor it in place. Place the bulbs in a bright sunny room. A window sill is a good choice. Paperwhites – They will do best in a shallow bowl, dish, or a bulb vase. Amaryllis – They will become top heavy, so as the plant grows tall it will require staking to keep the stem supporting the beautiful blooms from tipping. Paperwhites – Take care not to let the bulbs dry out. Keep them watered. If they are not kept fully hydrated, they will not thrive. After they are completely done blooming, cut off the stalks that the flowers bloomed on. Continue to care for the green leaves (the plant) until spring when they can be transplanted into the ground OR your container can be moved to a sunny location. Feed with an all-purpose fertilizer. Dig up in the fall, trim all of the foliage back to about ¼ inch from the bulb and allow to dry. Start the process over again. Many a Christmas comes and goes and I wish I had remembered to mark my calendar to give myself the approximate 6 weeks to start these stunning plants. Well, this year I am going to have an attractive centerpiece, and I hope you will too! Holly is a regular contributor to Appleton Monthly magazine.